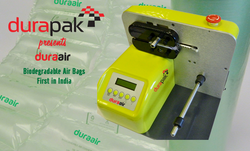 Our immense experience and expertise in the field of packaging products has enabled us to deliver the most innovative, reliable and cost effective packaging machines and materials. We offer packaging machines like vacuum packaging machines, shrink packaging machines, skin packaging machines, shrink packaging machines, fully automatic packaging machines, etc. We have our tie ups with well-reputed companies in the market who are known for their exclusive quality and imbibing latest technology into their products. Whatever you need packaged – talk to us. We’re experts at providing custom-engineered solutions – be it just shrink wrapping, carton strapping/sealing or the automation of the entire secondary packaging line until the palletization, we’ll create the most efficient system for your business.